Johnny Carson premiered as the new host of The Tonight Show today. His first late-night guests included Joan Crawford, Tony Bennett and Mel Brooks. This would mark the beginning of a new era in talk show popularity. 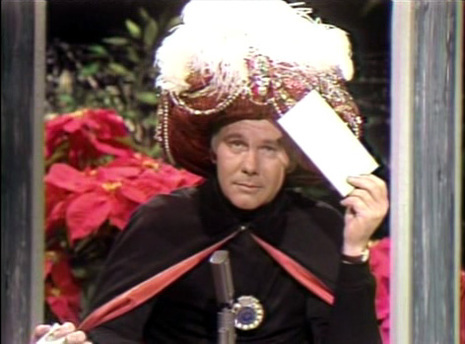 "Carson, who was selected by NBC to succeed Jack Paar as permanent host of the late-night show, moves over from ABC-TV, where he was emcee of 'Who Do You Trust?' Making the same switch will be announcer Ed McMahon who replaces Hugh Downs," the Oakland Tribune reported on October 2, 1962. NOTE: As host, Carson's witty personality and style influenced the TV show, and viewers tuned in for the laughs. In 1972, ten years after Carson took over, newspapers reported that The Tonight Show was NBC's biggest moneymaker. Carson hosted the show for 30 years until Jay Leno took over in 1992.